It's fall, which means it's also apple season! Time for sweaters, hot spiced apple cider, and leaf piles. Start your morning right with any of these seasonal apple breakfast ideas! Apple Pie Breakfast Cookies, Apple Cider Sangria, and Sweet Apple Cinnamon Muffins are sure to please anyone on a fall morning! 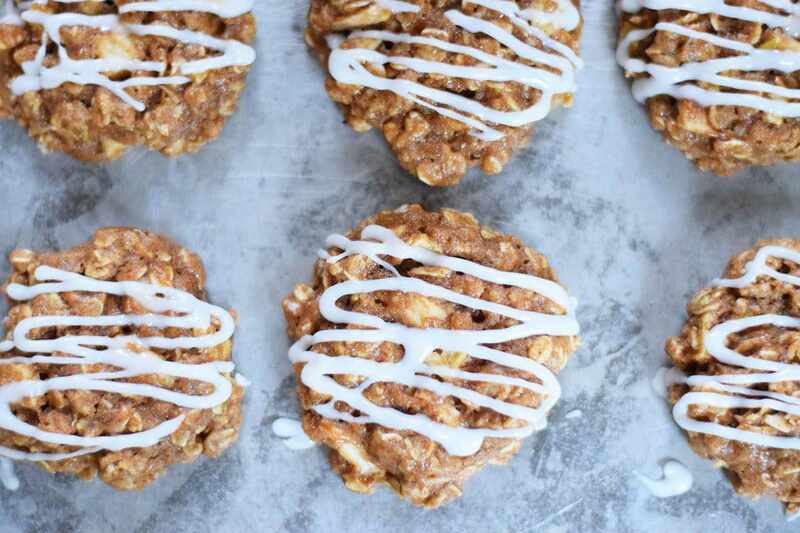 These apple pie breakfast cookies are so easy to make. What's not to love about apple pie? Especially when you don't have to roll out pie crust! They are like having oatmeal to go! All the heartiness of oatmeal without the fuss of a bowl and spoon! Drizzle them with a delicious glaze and you will be in apple pie heaven! Muffins are another quick and easy breakfast idea. This apple cinnamon muffin recipe creates amazingly moist and flavorful muffins. The diced apples add nice texture and will remind you of apple picking! A sweet glaze makes them ultra decadent. You can use any kind of apples that you like! When granola is done right, there's nothing better. Serve this apple pie granola on top of yogurt, with milk, or just on its own! It's perfect for breakfast or for snacking! It tastes just like apple pie with the added deliciousness of raisins and coconut! These cinnamon rolls are worth the work! They are covered in a caramel glaze and filled with freshly picked apples! They are soft, chewy, delicious, and are sure to please anyone on a fall morning! Hot and crispy apple fritters are perfect morning, noon, and night. They are best served hot and fresh. We like to diced the apples a little on the thicker side so that you get a nice piece with every bite! Apple Danishes are so simple, yet so delicious. They are definitely best when made with apples that are in season. A little puff pastry, butter, and some honey are all you need to make these delicious, easy breakfast pastries! Breakfast does really not get any easier than apples on toast. We love topping toast with ricotta cheese, freshly sliced apples, and a drizzle of honey! Apple Cider and Prosecco; is there anything better? This is the perfect fall cocktail and it is so easy to make. I love adding a little caramel vodka to make it taste just like a caramel apple (without all the fuss of making caramel at home! ).